Up to Nature was a festival organised by Bristol-based In Between Time in Woodchester Park, Gloucestershire from 29th June- 1st July. It brought together work by international and local artists, providing a different site and space for live art encounters. 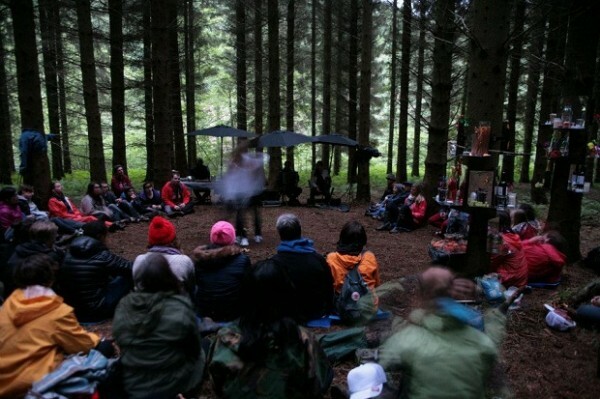 The festival is part of a wider international project across four different European forests, and a co-production with ANTI- Contemporary Art Festival (Kuopio), Black Box Theatre (Oslo), brut wien (Vienna) and Maska (Ljubljana). I’m sat in a womb-like tent, its white fabric walls in stark contrast with the slightly wet mud that serves as its ground. The forest, thick with sounds and still dripping from the recent summer shower that invaded its rhythms, watches over us, a participative companion to this space- and the ceiling for the tent, pierced by occasional rays of sun that dry up patches of the soil. I can hear her feet digging with energy into the ground, lifting up from the bounce and then pushing the earth back in. In the midst of a ritual, earth crumbling from her legs and feet, with the confident and gentle voice of a wise storyteller, Nic Green is creating a space for fables, diluting time and transporting us in the garden of the small isolated Scottish house that was her shelter for a whole year. In Slowlo, seasons pass us by, cyclical and choreographed, as nature becomes an aesthetic and sensorial site of ritual paved with archives, from the bones of animals killed by the harsh winter- or a hungry predator- to the delicate sounds of birds in spring. Nic Green dishes out these dreamlike fragments, searching and sharing an authenticity of experience, re-creating an internal landscape that, as time passes, begins to merge with its surroundings. There is nothing but nature and silence; “calmness is activity”, she tells us. As we sip the delicately sweet and bitter taste of cold rose tea, passed around the circle in a ritual of encounters, we are guided by Green to a different place at the threshold of worlds. We are residing both in the soundscape of the forest, tucked away behind the shade of the tress, embedded in this living archive, and in an internal, emotive landscape with a similarly natural rhythm. This feeling of atemporality, of getting lost across places, of searching for the authentic felt very much the heart of In Between Time’s Up to Nature. A festival that intervened in the natural, seeking to allow it to exist as its own space of fantasies, but also as a site to access fragments both internal and nostalgic, humorous and playful. Nic Green’s transgressive piece is a story as eerie and fable-like as it is real; highly physical and gripping, its atmospheres and thoughts penetrating past the walls of the tent, its narrative echoing through the thick branches that pet this landscape. It’s dusk, and I’m walking down a dimly lit mud-path, fighting the weight of wellies knee-deep in mud, daytime sounds fading into the soft breeze of night-time winds. We arrive at a forest clearing; it’s different from the path we’ve just taken to get here, probably a new forest, trees perfectly aligned, slim and svelte. As the moon appears through the tall pine branches lining the sky, pushed around by a cold summer breeze, I notice two performers standing in the middle of our circle; their arms are painted white, long hair obscuring their faces. 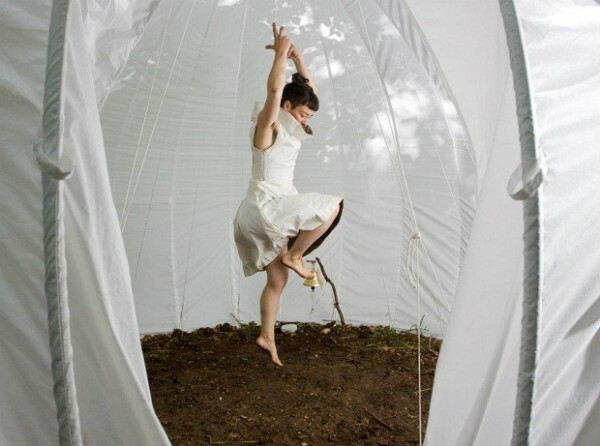 As they move like two pendulums in and out of sync, gaining more momentum in their contact with the ground, sounds begin to filter through the site, at times atonal and at others musical, screeching and teasing out the moon light, in perfect antithesis to the durational repetition of the movement routine. It’s an extended moment that guides us through this passage from dusk to night-time, softening our landing in the deep darkness of the forest; a mesmerising accompaniment that makes visible the forest itself, all magic and mystery. We stand by the brief light of small candles, congregated around trees, talking late into the night. Fiksdal/Langgard/Becker’s Night Tripper stands confidently at crossroads, inviting a choir of spirits to sing for us. We view nature through a cultural lens, Dee Heddon tells us. We seek to displace nature’s agency, perhaps in a willingness to separate it, to externalise it, despite our own embodiment of nature. Through both the works in the Festival and in the accidental social interventions, nature is brought into a political fold. Heddon’s series of short podcasts- The Nature of Water, The Nature of Forests, The Nature of Camping and The Nature of Bird Songs- are a journey in their own right. I take an ipod and listen to these on a walk through the forest, veering off the path, turning at the wrong places and eventually finding my way to a lake; I walk past campers asleep at the entrance to their tents, past landmarks altered by an artist, all characterful and cheery, past hammocks in trees and lone walkers and birds I cannot name.